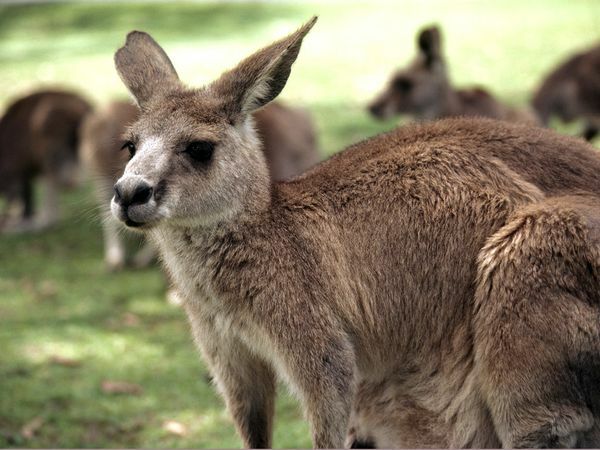 Kangaroos are the animals that come from Australia's most iconic, and be trandmark Australia that runs by leaping. 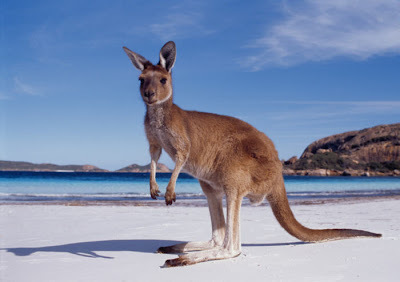 There are more than 60 different species of kangaroo and their close relatives, with all the kangaroo family-owned Super Macropodoidea (or macropods, 'big-foot' that means). Super family is divided into families Macropodidae and Potoroidae. Macropodidae (macropod) which includes a family of kangaroos, wallabies, wallaroos, pademelons, tree-kangaroos and forest wallabies. Species in the macropod family vary greatly in size and weight. Potoroinae (potoroid) including the family of kangaroos potoroo, bettong and rat-kangaroo, which lives only in Australia. Types of Kangaroos live in all regions in Australia, from cold climate regions and desert plains, to tropical rain forests and beaches. red kangaroo is the largest marsupial animals are still alive. kangaroo males have a height greater than 2 meters (6-7 feet) with a weight of 90 red-breed kg.kanguru if there is rain and grow new plants. Eastern Grey kangaroos (Macropus giganteus) is less well known than the red kangaroo (outside Australia), eastern gray kangaroo can be found in the fertile eastern part of Australia is Australia. 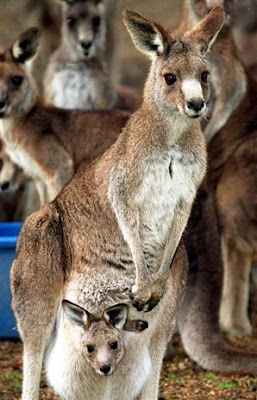 Western Grey Kangaroo (Macropus fuliginosus) has a smaller size, to kangaroo males weight about 54 kg. It is found in the southern part of Western Australia, South Australia near the coast, and the Darling River basin. 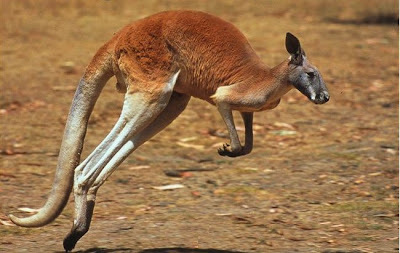 Gray kangaroos hop along on their hind legs are strong and do it with high speed. A gray kangaroo can reach speeds of more than 35 miles (56 kilometers) per hour and travel for long distances at 15 miles (24 kilometers) per hour. Their gates hopping allows them to cover 25 feet (8 meters) in a single leap and jump 6 feet (1.8 meters) high. When the baby kangaroo is born, at birth was smaller than a cherry. Baby kangaroo then immediately climbed into the pockets of its parent and does not show up for two months. Until they reach the age of about 10 or 11 months. Kangaroos have powerful hind legs, large feet adapted for leaping, long tail for balance muscle function. Like most marsupials, female kangaroos have a pouch called a marsupium for the development of post-birth baby kangaroo. Greater muscular male kangaroo. They often rely on the tail with a sturdy and strong hind legs. Male kangaroo scrappy and can bite and scratch in combat with the enemy. Kangaroos are herbivores, eating various plants and in some cases eat the mushrooms. Most kangaroo animals active at night but some are active in the morning and afternoon. Various species of kangaroo living in different habitats. Potoroids live above ground in trees. Larger species of kangaroo tend to shelter under trees or in caves and rock cracks. Most kangaroos have no set breeding cycle and are able to breed throughout the year. Because they are such prolific breeders, a kangaroo population can increase fourfold in five years if it has continuous access to plentiful food and water. 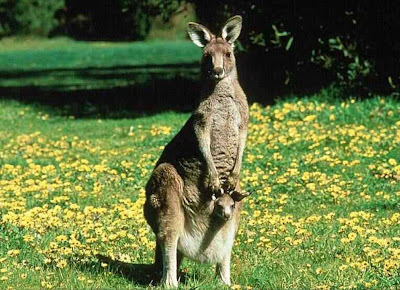 Kangaroos have stomach chambers similar to cows and sheep. They chew the cud. Different species of kangaroos have different diets. Eastern Grey kangaroos eat a variety of grasses whereas some other species (eg Red Kangaroo) include a large number of shrubs in the diet. Smaller species of kangaroos also consume hypogeal fungi. Kangaroos usually spend the day resting in the shade, night and morning moving and eating kangaroos. kangaroo has a special gear. Since both sides of the lower jaw are not joined together, the lower incisors are farther apart, giving the kangaroo a wider bite. 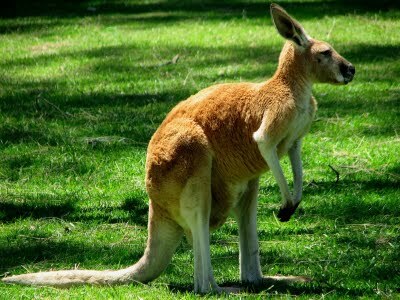 Picture the symbol animals of Australia "kangaroo"